The election is slated to begin April 26, 2019 and end Friday, May 17, 2019. Click here to go to voting web page. Between April 26, 2019 and end Friday, May 17, 2019. Any Oahu resident who will be at least 18 years of age by February 15, 2019 can become a registered voter, including military personnel, military family members, and legal resident aliens. If you voted in the 2018 General elections, you are automatically eligible to vote in the 2019 Neighborhood Board elections. Residents who are not eligible to vote in the General elections may also submit a voter application to the NCO specifically for the Neighborhood Board elections. Forms must be postmarked or hand delivered by February 15, 2019. How can I find out which Board or district I am eligible to vote for? There is a street index posted online at www.honolulu.gov/nco. Assistance is available by calling 768-3710. When will the Neighborhood Board elections begin and end? When will voting passcodes be mailed out? Passcodes will be mailed out to eligible voters prior to Friday, April 26, 2019. Voters residing in an uncontested race area will not receive a passcode. Online Voting Ends: 11:59 p.m. on Friday, May 17, 2019. What if I can't vote online? If you are unable to vote online, you can request a paper ballot by calling the Ballot Request Hotline at 768-3763 no later than Monday, May 13, 2019, 4:30 p.m. with your full name, last four digits of your SSN, and residential address. Returned ballots must be postmarked by Monday, May 13, 2019 and received by the NCO no later than Friday, May 24, 2019. The Results are released no later than 7 days following the end of voting. How often are the Neighborhood Board elections? Neighborhood Boards are elected every two years, in odd numbered years. Why doesn't the NCO hold elections in conjunction with the State elections? The State has opined that the Neighborhood Board elections may not be permitted into the State's polling places during the conduct of State or County elections. Why is on-line the preferred method of voting? In 2009, Neighborhood started on-line voting as a means to cut costs and be more environmentally friendly. Why will uncontested districts not receive a passcode? This is a cost-saving measure as uncontested districts have one or fewer candidates, in which case voting is not necessary. Come learn about what's going on in the Kaimuki community! Come learn about what's going on in the Diamond Head Kapahulu Saint Louis community. A neighborhood board close to the Kaimuki - Honolulu, Hawaii area. Come learn about what's going on in the Palolo community. 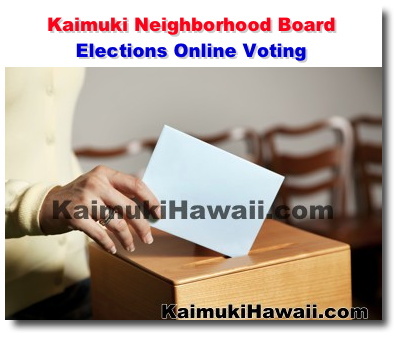 A neighborhood board close to the Kaimuki - Honolulu, Hawaii area. View multiple Twitter feeds from featured Kaimuki Hawaii.com businesses, people, etc.